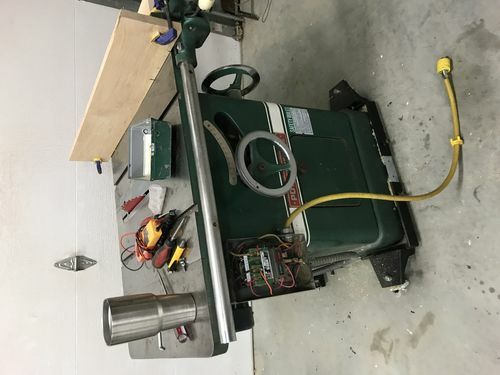 When I purchased my table saw it was wired in the 120v configuration. I attempted to switch it over o 240v this evening, using the diagram glued to the back of the starter panel. 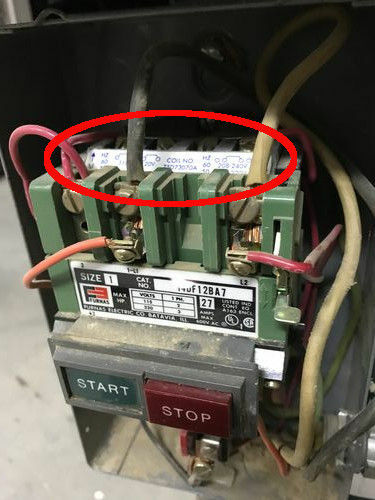 Apparently I swapped the connections on the coil in the wrong configuration because when I hit the start button all I got was a pop from the starter and my breaker kicked in my electrical panel in the garage. Knowing that I made a mistake I switched the wires back to the original 120v configuration and tried to start the saw, but now the contractor will not pull in. When I manually close the contractor the saw runs fine but the contractor just will not pull in. The reset switch isn’t tripped so I’m really at a loss for how how to approach it from here. Any input would be appreciated. Mightve blown the coil on the starter. A close up pic would help. I’d say you fried the starter coil. That would be the coil of wire that sets up a magnetic field around the contacts and pulls in the iron mount in the middle of the contacts. You might be lucky and just fried the overload. Thanks for the quick responses. I found some replacement coils on eBay. I think I might try to get one and see if that fixes the problem. It’s fairly easy to check. Check continuity on the coil. As a general rule, If it has continuity it’s good. If it doesn’t it’s bad. Just make sure you disconnect either one of the leads to the coil when you do it. I checked the continuity on the coil this morning and it appears to be good. I already ordered a replacement coil. Could it be possible there is something else that would keep it from pulling in? Post a closeup of your starter so we can see what you got. Sounds like you toasted the low voltage control transformer. Close ups of the starter. By the way I appreciate all the helpful responses. 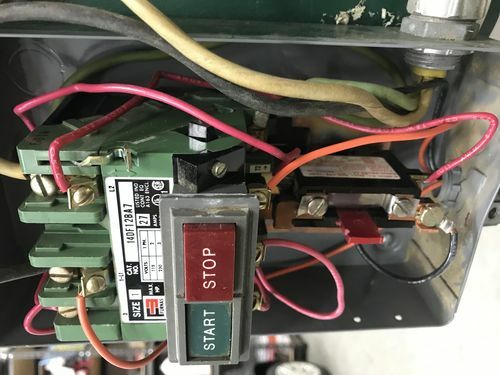 Still can’t really tell, but across the top there are some jumpers to set the control transformer supply voltage… did you change that when you switched to 240v? If you didn’t, then you most likely fried the transformer running it on 240v when it was still wired for 120v. 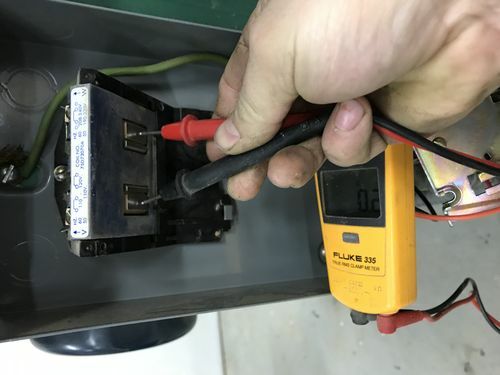 Should be easy check though, just plug it in and see what voltage is coming out of the transformer with a meter. The voltage should be marked on the transformer label (circled). I received my new coil and installed it this evening with no luck. I got my meter out and started tracing the power. I found I have 120v coming in on the white wire in the photo below. From there it goes into the overload relay on the bottom but stops there. The relay is not tripped so is it possible that it’s the problem? At this point I’m considering buying a new starter. Could I just get one of the grizzly starters and swap it out? Just to make sure – did you push in the manual reset (red button at bottom) to make sure it wasn’t tripped? 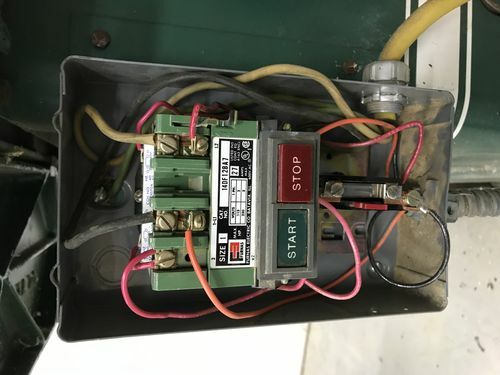 Also, is there a control voltage transformer (not the coil)? Symptoms sounds like you lost control voltage, since it will work when manually engaged. Just to make sure – did you push in the manual reset (red button at bottom) to make sure it wasn t tripped? Also, is there a control voltage transformer (not the coil)? Symptoms sounds like you lost control voltage, since it will work when manually engaged. I think Brad has a good suggestion. I feel your pain! Had an old 3 phase bandsaw with the same problem on a similar control. 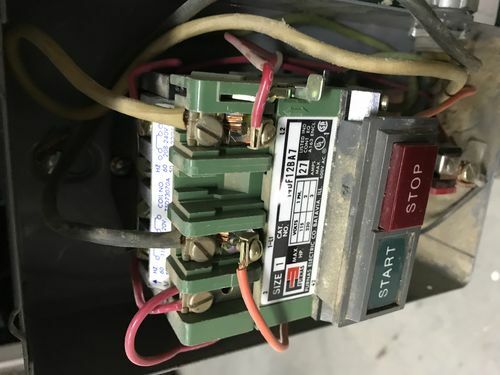 I could manually push up the contactor to make it start. I never actually addressed the issue though, since I was converting to single phase. I merely bought a single phase motor and new switch, and put the old motor and control in a box on the shelf. Probably needs the control transformer replaced but I was sick of messing with it. Laziness prevailed lol. Since yours is already single phase it’s probably worth the effort to get the control fixed or replaced. That’s a really nice saw! How about a pic. 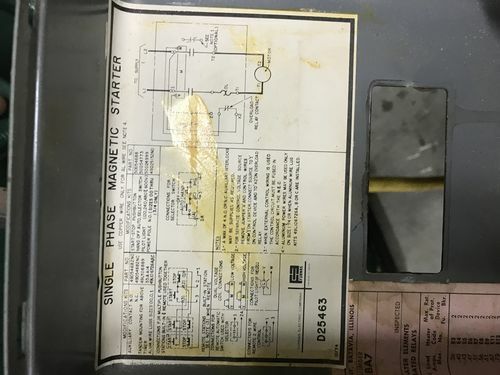 of the wiring diagram on the cover. Thanks for all the responses. After much frustration I ordered a new starter from amazon. Definitely not the quality I had, and I’m not giving up on my old one but I need to get the saw back up and running.